The emergency exit doors in subway stations throughout the city are the scourge of the system. Installed in 2005 and 2006 to provide fast egress in the event of an underground emergency and equipped with an ear-splitting alarm, the doors are rarely used for their intended purpose. Instead, people who think rules don’t apply to them use the exits to escape crowds at turnstiles and generally get out of dodge faster than the person next to them. Today, the New York City Transit Riders Council issued a call for better emergency exit policies. In a report released this morning (PDF here), the NYCTRC unveiled results of a study its members conducted of the emergency exits. These rider advocates found widespread emergency exit abuse and numerous instances of fare evasion. The group found examples of herd mentality and concluded, as anyone who spends enough time near the subway’s fare-control areas, that the alarms are completely ineffective. In the course of sixteen hours of observations during peak hours and nineteen hours of observations in off-peak hours, our surveyors counted a total of 2,308 passengers using designated emergency gates for access to and egress from the paid area of subway stations. Most of this activity involved 2,115 individuals who exited the paid areas of the stations through the emergency gates. Our surveyors also observed 193 individuals entering the paid areas of stations through the emergency gates. In 109 cases, surveyors indicated that these entries into the paid areas appeared to be made in the course of evading fare payment. So when do people use the emergency exits? According to the council’s observers, those brave souls willing to risk setting off the alarm do so to “relieve a backlog of riders waiting to exit the station.” However, as I witnessed this summer at the relatively empty north end of the City Hall/Chambers St. stop, some people use the emergency exit because it’s the door closest to the stairway. Convenience often trumps manners. And what of fare evasion as well? Only around five percent of emergency exit use constituted examples of fare evasion, and the NYCTRC says the vast majority of those fare evasion uses came at one station — 125th St. and Nicholas Ave. — where the gate was unlocked and unalarmed. “Clearly an open gate without an operable alarm is an invitation to individuals wishing to enter the system improperly,” says the report. Unfortunately, the report is low on recommendations. The Riders’ Council suggests that monitored exits deter improper emergency exit use, but that alarms are not the answer. “We believe that because the alarms sound very frequently, they have lost their ability to alert riders to a possible emergency,” the report says. “If anything, [the alarms] serve to distract a shrinking force of station personnel from other duties.” The alarms may also alert those looking to avoid paying that the gate is open. Without station agents at every exit and with emergency gates so porous, the Riders’ Council suggests video monitoring, a silent alarm and a better locking mechanism for the gates. The best answer might just be targeted police sweeps aimed as those who are violating the emergency exit rules either to enter without paying or to exit improperly. The emergency exit debate has been raging for years and with no end in sight. The NYCTRC report confirms what we know: that emergency exits are far from perfect. If you build it, New Yorkers will abuse it. The “emergency” gates are the only entrance/exit available for people with bicycles, strollers or other bulky items. When stations were manned, such passengers would wait until being buzzed in by a booth attendant. But nowadays, you’re on your own. When entering, this means swiping the Metrocard at the nearest turnstile and then asking someone to push open the gate from the platform side. If cops are watching, hopefully they see you pay. Highly imperfect. At the two stations I use most often, there is no alarm when the emergency exit is opened. Police are often right there, and they do not say a thing. For some reason, this blog continues to make the absurd statement that it is somehow “rude” to leave the fare-control area via an emergency exit: “Convenience often trumps manners.” Certainly, in those stations where there is no alarm, I find nothing rude about it at all. Whether you should do it is a whole other question—maybe the police will change their minds someday?—but for now, I don’t care either way. I also don’t see why this blog calls them the “scourge of the system.” If you look up “scourge,” you’ll find it’s a rather harsh word. The emergency exit doors are pretty far down on my list of subway inconveniences. It is obnoxious and potentially can damage one’s hearing. Convenience does not trump manners. That is known as being selfish and rude. When you drive, do you utilize an empty sidewalk or opposite direction lane? Grow up and wait your turn, or take a cab. I specifically said, “where there is no alarm,” which entirely undercuts your claim about damage to one’s hearing. What exactly is selfish or rude about that? How does it affect you at all? You make it sound as though unalarmed doors are the rule and not the exception. They’re not. I do realize that; but the alarmed ones aren’t the “scourge of the system,” either. My apologies Marc as I missed that part of your post. If there is no alarm then I’m not concerned. The rudeness is a hideously loud alarm that does nothing useful but may in fact damage our hearing. The rudeness is not due to users with their baby carriages, bikes, or other encumbrances, or who are simply crowded due to a shortage of exits. We did not install these horrible alarms. The rudenesss comes from a subway management that does not remove the damnable alarms because they just don’t care if we have to hear shrieking noises or not. After all, the executives and the transit board members don’t ever hear these awful noises in their limousines. At least in many cases, there is a button on the side of gate that summons the agent, who can unlock it from the booth. That’s the way you’re supposed to get in or out with a stroller, etc. In practice, everybody does it your way. Not all gates have the buttons, and even where they do, I think the agents simply assume that everybody’s going to set off the emergency exit, so they don’t bother to unlock it themselves. I often travel with my child in a stroller. The ONLY way for us to get in (without removing the child from the stroller, all her belongings, diaper bag, toys etc and collapsing the stroller) is through the emergency exits. We swipe our cards, my wife walks through the turnstile, she opens the door (buzzing if possible) and then I pass the stroller through, then close the door, and then I enter by swiping and going through the turnstile. Great if there is a station attendant, but not possible to do it without the alarm when there is no station attendant (which we always encounter at least once, on the return end of our trip). It’s not rude that we use this means to exit and enter the system, we try to buzz when that option is available and we always swipe and use the turnstiles. The system is poorly designed in many respects, this is one of them. The Metro in DC has a much better system, turnstiles for exit only. NYCT should implement something like this. It’s not just herd mentality. The reason people don’t go through the emergency gate is largely because the alarm is really loud. Once somebody activates the alarm, that really loud alarm is going off, whether you wait in the queue at the turnstile or not. In fact, waiting on line to go through a legal exit prolongs your exposure to the alarm! In this way, you’re actually rewarded for following the rule-breaker through the gate instead of waiting and covering your ears. People are just being rational here. Also, speaking of the 125th and St Nick station, the exit at 127th Street is now fare-beating central, now that there’s never a booth clerk there. I would question the utility of the “emergency exits”. As more and more (highly trafficked) station entrances/exits are equipped with the god-awful death cages, it makes it very aggravating and time-consuming to get out of the subway. Who enjoys that game of chicken that ensues whenever two people are trying to enter and exit at the same time? I don’t support people using the door just because it’s closer, but the report (or at least your summary of it) fails to realize that there is a failure of crowd control with the emergency exits, and passengers using them to leave a station are doing so for an actual reason. Actually, the death cages (HEET’s) weren’t installed in the most recent rounds of booth closures – apparently the policy requiring them at unmanned booths is no longer in effect. One hopes that the remaining HEET’s will be gradually replaced with standard turnstiles, since there are serious queuing problems at some HEET exits. I use the Hunter college station a lot, I live near it. The emergency exit is often used when everyone is exiting. This station has one entrance and is very busy – and waiting at the turnstile is just annoying. I don’t know what the alternative is. If money weren’t an object, there would be another exit from this and other busy stations. Since money is not free-flowing, a “circle” of turnstiles may be more suitable for this station and give more flow. A potential solution is to make the Emergency Exit gate harder to use. It could have a latch mechanism that sprays indelible ink on the hand of the person who unlocks it, just like fire alarm pull stations in public buildings. If you need to get a bulky item through, the token booth’s “buzz” latch would bypass the ink spray latch. Sure, the MTA might not get around to replacing the ink cartridge right away, but how many New Yorkers want to risk getting sprayed with ink? The ink spray is a deterrent to abuse, plus it makes it easier for the police or the MTA to pick out who opened the gate. If it is a real emergency, I think 99% of people would rather have some ink on them then die in a tunnel fire. Perhaps because I’m Deaf — I use the Emergency Exits. Especially at Broad Street which is now the end of the line so the quantity of people leaving is far greater as we are all getting off the train at that point. Well, please think about us hearies who have to listen to that alarm! Take off the alarm or listen to it. Those are the stark choices. I choose to take off the alarm. It’s not that difficult. Taking off the alarm defeats the purpose of the emergency exit. In what way does it defeat the purpose? The purpose of an exit is to exit. If the purpose of the alarm is to summon the police, but the policy of the police is not to respond, then the alarm has no purpose. And all the concern about farebeaters, that’s a big f-ing deal, sin e the survey showed about 5% of the users leaving through the so-called emergency exits. No wonder the police have decided there are better uses for their time and energy. Let’s deal with reality here. These are simply auxiliary exits. Let people use them without being punished by shrieking useless noises. The purpose of the emergency exit isn’t to provide a more convenient exit for people too impatient to wait at the turnstiles. It’s to provide a high-volume egress in the event of a subway emergency. It’s alarmed to alert authorities to the fact that there’s an emergency, and it’s a one-way only to ensure that people don’t enter the system without paying. Removing the alarm is akin to granting permission to fare evaders. If you want to advocate for removing the alarm, then these doors should be reconceptualized as high-volume exits. They can’t remain as emergency exit doors with the alarms removed whether or not you personal feel that the doors are inconvenient and there to be abused. But Ben, they’re not used as emergency exits, and you’re never going to get people to stop using them as regular exits, save draconian penalties. There is a design problem with exiting the subway. These doors provide a solution. 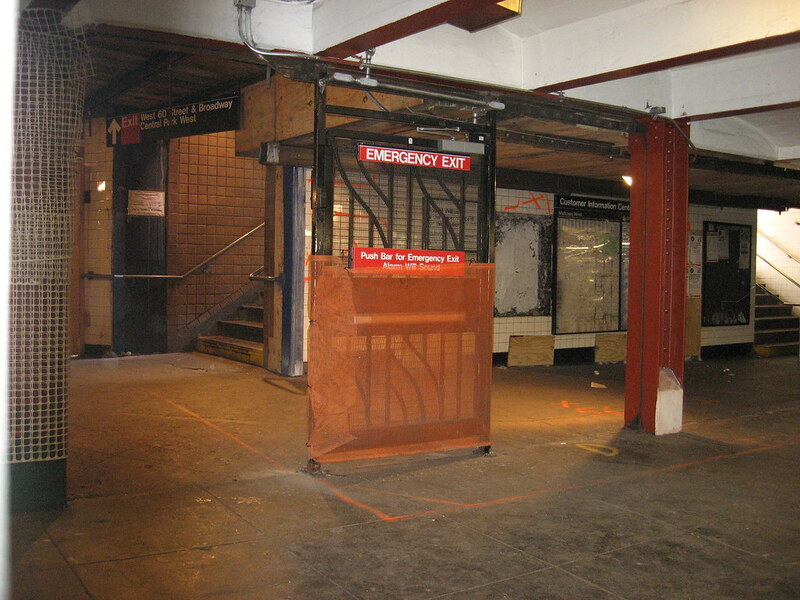 Until the mid-90’s when the then-new MetroCard turnstiles were installed, the slam gates were used for exits. By design. Perhaps it’s time to revive that practice. The crime rate isn’t close to what it was in the early 90’s, when the MetroCard system was being designed. In addition to all these good suggestions, the time has come for the MTA Board to add emergency exit abuse to the subway code of conduct as a violation subject to a fine. Such an action will help serve as a deterrent and an additional source of revenue for an agency and city all too happy to create punishable offenses that they can impose fines on. Remember how some riders were not happy when the board acted to make it illegal for passengers to walk between cars. Although the MTA had safety (and potential liability) in mind, I believe riders had valid concerns that they couldn’t get away from an unpleasant situation. From a practical standpoint, fining those who violate the emergency exits makes much more sense, and should be better received by the public. Whenever I take the J train to Canal St Station, the flock of passengers exit from the emergency exit that much more conveniently leads to Centre St than do the fare gates. Of course if you design the station this way, you will only tempt passengers to break the ordinance. An emergency exit should offer a reliable route to safety, but it is not helpful to make it a more convenient exit than the fare gates if your goal is to get them to use the gates. In other words though, that wide open door offers a more timely alternative than waiting for passengers to exit the fare gate one-by-one. The MTA should consider making faster, free-flowing, legit exits where passengers tend to bunch up. I would agree. Design thinking says that people will make solutions where there is a design problem. This isn’t scofflaws intentionally breaking the law; it’s a system not designed for maximum throughput. That’s a design failure, not a transit rider failure. Indeed. Case in point at very busy station: Grand Central, northern exit of the Lex IRT. The emergency gate on the left side (when exiting) and nearest to the Uptown side is opened constantly (and I’ll do it w/o pause myself). Next to it there are only three turnstiles then a huge structural column that serves as a natural barrier and increases the distance to the adjacent fare array. You are absolutely correct in pointing out that people will make solutions when there is a design problem. This may be true for the convenience of the majority of passengers, but shouldn’t the closest exits be for those who have trouble moving around? It’s really not fair to force those using wheelchairs to travel the farthest distance, particularly in an emergency. It’s analogous to putting the handicapped parking spots being closest to a store entrance. If an elevator or even escalator existed near that side, sure. Not the case here. Also, a center placement is directly with line of sight of the booth (even if now only part-time) where one at least has the possibility being helped (by being seen). Placing such an exit door where the line of the sight is obstructed (partially) by that column just isn’t a good idea. Do you also go around toll booths when there is a wait or drive on the shoulder during rush hour. I commute rush hour every day and have to use very busy stations. I never use the gates – and manage just fine. Contributing to this is an insufficient inventory of turnstiles. At my home station, a rather busy one, there are 3, count ’em 3, ways in and out. Since there is ample traffic both ways, especially at rush hour, you have lots of people fighting for ingress/egress. Add to that all those idiots who loiter at the turnstiles, swiping 50 times in the hopes of their card actually saying sufficient fare that 50th time, or the ones who go through their personal items first looking for their MetroCard at the turnstile, and the ones simply just hanging out there, all conspire to make the emergency exit gates a quite tasty alternative. Aside from the very good points made by Christopher, Ariel, and others, I fail to see what exactly the problem is with using the emergency exits to exit a station. Fare beating is an obvious answer, but that’s a design problem. The alarm is extremely painful to listen to for those of us with good hearing. Also it is potentially damaging to my hearing and I can only image the damage to the infants. Simple solution: Remove the alarm. At Sutphin/ Archer in Jamaica, the emergency door is usually open to allow those passengers with roll abord luggege to have an easier time getting to the Airtrain. Mind you there’s a booth facing the gate, so anyone who tries to enter without swiping in first is doing it in full view of an atendent. Being visually challenged, I have used the emergency gate ONLY when my path of travel is blocked by large crowds wich is rare. Dumb question… since a Metrocard is only required for entry to the subway, wouldn’t make to divert exiting passengers through that gate instead of blocking turnstyles? Ben, I love your blog, and I think you’ve done wonderful things for the subway community and I appreciate your hard work (just in case you ever feel that you’re doing something thankless). I rarely disagree with the sentiments you post. That said, I feel you’re actually in the minority of opinion in this case. 2,115 people used this as a way to deal with exiting issues in station design and/or lack of personnel. 109 people used the emergency exits as fare evasion. That’s 5%. I’d bet that a fair amount of that 5% would have otherwise just jumped the turnstiles (if there are any) as they aren’t afraid of the alarm. What I’d *really* like to see is what percentage of those two thousand did it to deal with station flow problems. E.g. how many people did it in “break the ice” situations. I wonder if those surveys took into account the number of unlimited pass holders who used the gate to save time – I’ve got an autogate card, and if someone’s already popped the gate open, I’m not going to get in the way of outbound traffic (strollers etc.) to swipe in a pass when I’ve got an unlimited pass on the card, particularly when I don’t trust an already-open emergency exit to not eat my autogate card for breakfast. This with particular frequency at Park Pl on the Franklin Av shuttle, which has people arriving in spurts from the C or the B,Q transfers and is empty 95% of the time but overcrowded the other 5% of the time. The emergency exit is the closest exit to Prospect, and it’s opened frequently due to how easily a crowded train can backup the small ‘mezzanine’ area. Because of the wheelchair I’m rarely the first person there, but I would suspect that the station agents frequently open it themselves to facilitate exits by strollers and large crowds. Be careful. Even if you have an unlimited card, the cop hiding behind that column over there doesn’t. It is a violation to enter the system without swiping, even if you have an unlimited. Yeah, that gate has numerous problems – the autogate part of it went un-repaired for months (I don’t live in NYC but visited frequently until this summer), but on the bright side I was on a first-name basis with the sole booth attendant, who since it was a small and comparatively remote station was generally the same person every weekday. But that’s good to know – I don’t worry about doing that at Park Pl but I’ll be more careful at stations like Herald Sq – Herald Sq is a terrible setup with the autogate that somehow encourages massive numbers of people to exit by the autogate emergency exit on the elevator side, next to the PATH tunnel – it can take a good 2-3 minutes to get through that gate if an attendant doesn’t start yelling at people to get out of the way for me. Only Grand Central is worse for me, but I’ve always written that off as being an issue of the bridge-and-tunnel crowd coming in on Metro North and being a bit unfamiliar with what is a fairly confusing setup at GCT’s subway mezzanine. Strangely, I’ve had booth attendants tell me to go on through without swiping before. Guess it’s a case of the right hand not knowing what the left hand is doing, but it’s very rare that I don’t have at least a weekly pass in NYC so they’ve never actually lost revenue on me for that. Maybe adopt Parisian-style fare-control gates? Instead of turnstiles, you have a pair of blinker doors you can’t jump over: insert money to enter, push to exit. No trouble for bikes, and make sure at least one gate is wide enough for wheelchairs. As previously stated, the problem isn’t passenger etiquette; the emergency exits are simply the most efficient and high-capacity way to exit at many stations. A better strategy to copy from Paris would be proof of payment control. Not on the subway – it’s too crowded at rush hour. But on the buses and commuter rail (since the LIRR will never be the RER), you’re right, it’s the best strategy. People jump the turnstiles in Paris all the time. I would blame the law that requires emergency gates to have the ability to be unlocked at all times. Before then, around the time turnstiles were being retrofitted for MetroCard use in the early 1990s, I think emergency exits other than the service exits near the token booth were closed. I may be wrong, though, as I was only a child then.